PatronManager clients can now turn data into dollars. 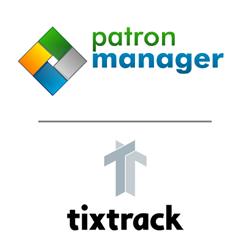 TixTrack and Patron Technology are pleased to announce a partnership enabling Patron Technology’s PatronManager clients to use TixTrack’s data driven approach to manage their ticket inventory and optimize their ticket pricing. TixTrack provides custom built interactive venue seat maps that enable simple, dynamic, visual inventory management. Founded in Los Angeles in 2008, TixTrack was created to bring a new brand of rigorous thinking and science to the business of live entertainment ticketing. TixTrack is being used by some of the leading sports and entertainment companies, including Cirque Du Soleil, Los Angeles Clippers, Feld Entertainment and over 100 venues throughout North America. ABOUT TIXTRACK: Founded in Los Angeles in 2008, TixTrack was created to bring a new brand of rigorous thinking and science to the business of live entertainment ticketing. TixTrack provides a web based software tool that allows organizations to better manage their ticket inventory and optimize their pricing using a highly data driven approach. Using sophisticated modeling it includes interactive seat maps of venues that enable simple, visual "heat-map" inventory management. TixTrack Professional is integrated with a variety of ticketing systems across the ticketing industry including some of the leading sports and entertainment companies, including Cirque Du Soleil, Los Angeles Clippers, Feld Entertainment and over 100 venues throughout North America. ABOUT PATRON TECHNOLOGY: Patron Technology aims to revolutionize the ticketing industry by providing arts and other live entertainment organizations with world-class customer relationship management (CRM), box office ticketing, fundraising, and email marketing technology. PatronManager, launched in 2010, is a cloud-based system built on the Salesforce Force.com platform, integrating ticketing, development, marketing, and staff collaboration. Patron Technology is a Salesforce ISV partner. PatronManager, used by over 500 organizations in the US and Canada, enables organizations to make their vital customer information available in one place, accessible both in their offices and on mobile devices. Founded in 2001 by Eugene Carr, the New York City-based company began by offering PatronMail, an email service used by arts and cultural clients in all 50 states, and is dedicated to educating the non-profit community about e-marketing. In the spring of 2011, Eugene Carr (CEO) and Michelle Paul (Director of Product Development) co-authored and published the book Breaking the Fifth Wall: Rethinking Arts Marketing for the 21st Century. In addition, the company presents a regular schedule of live e-marketing seminars across the country and live educational webinars, and publishes monthly email newsletters and blogs on topics relevant to the industry.